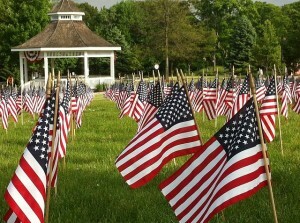 Memorial Day is for remembrance of those who have fallen and my heart goes out to them and their families. I can’t express my gratitude well enough. I would also like to express my heartfelt thank you to those I know and have never known for your service. 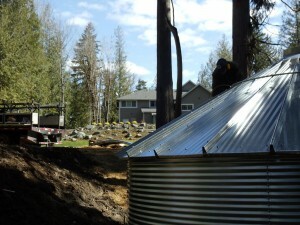 Many King County rural homeowners and farms are finding that rainwater collection as supplementary to their wells or community water systems is helpful in limiting overuse of their water supply. If you are in a water district or community water association, there are cost increases when you reach a certain level of use. Those who are on a lower producing well may find that supplementation maybe the answer for lower water volume or even salt water intrusion. Adding a rainwater collection system can lessen the demand on both. With more space than an urban building lot, larger storage can be the answer to your water needs. Large grain bin, steel tanks can store as much water as you may need. 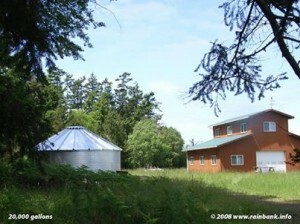 It is common for rural applications to have 10,000 to 50,000 gallons or more of storage. Irrigation, livestock watering, equipment wash down and even whole house use can be achieved with rainwater collection. Rainwater starts off relatively cleaner than surface water. With simple filtration, non potable applications can be the answer to digging a new or additional wells. With proper filtration and disinfection for potable use, water quality can exceed that of wells or community water without the added chlorine. Large roof areas found on farms can supply enough water for dairies, livestock and domestic use. A study of average rainfall and roof area can guarantee the amount of water you can collect. The return on investment of a rainwater harvesting system for a farm can be as little as 3 years, saving thousands per year on water costs. For the rural homeowner with large landscaping, water demand can be expensive. A larger cistern as a supplementary source can save money on your monthly bill from the water district. Whether your needs are large or small for water use you can benefit from rainwater collection in a rural application. What is the Key to Having a Safe Source of Water From Your Rainwater Collection System? This is Part 8 in the series. Click to see parts one, two, three, four, five, six and seven of “How to Build a Rainwater Collection System”. Whether potable (drinking water) or non potable (irrigation, toilet, laundry), filtration and disinfection are key to having a clean and safe source of water from your rainwater collection system. Of course, pre-screening the rainwater before it enters the storage tank is essential as discussed in part 3 of this series. Filtration for a non potable irrigation system consists of a sediment filter after the pressure pump. A 5 micron poly sediment cartridge filter will keep particles from clogging your soaker hoses and emitters. 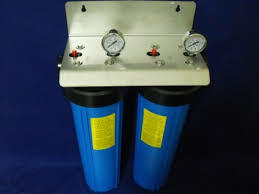 Cartridge filters come in various sizes. Smaller 2″x 8″ filters will need to be changed more often. Whereas larger cartridge filters, if not used regularly can hold bacteria and develop a bad odor. 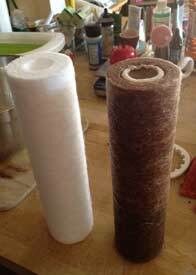 Generally for average irrigation needs, a 4″ x 10″ 5 micron poly sediment cartridge filter will do the job. Be sure to remove and discard the cartridge after the watering season so filter does not go sour during the non-use months. For non potable, toilet flushing and laundry facility systems, it is recommended to add a 10 Micron carbon filter. This filter will remove organics and inorganics, color and odor from you stored rainwater. By having the cheaper 5 micron sediment filter upstream of the more expensive 10 micron carbon filter you will save money by not fouling the carbon filter with particulate less than 5 Microns. Depending on how much use for this type of system, a 4″ x 20″ cartridge will mean less changing of filtration. If the system is to be shut down for a lengthy period, it is recommended that filter cartridges be removed so water will not become septic by decaying bacteria. Lastly if a potable system is desired, a 1 micron absolute filter that is certified NSF 61 for cyst removal is recommended downstream from the sediment and carbon filter. A 1 micron absolute sediment filter will remove cysts but is not intended to be the final disinfection for potable water. Again, a 4″ x 20″ cartridge will mean less change outs of the filter. A 1 micron absolute filter is intended to be used in addition to UV sterilization. With the UV to be the final element in the treatment system. We will discuss UV disinfection in part 9 of this series (check the box below to receive new posts via email). Regular inspection and maintenance of your filtration system will insure safe, and proper operation of your potable and non potable rainwater catchment system.